RIT is among the top third “National Universities” and the top 50 choices of high school guidance counselors, according to the latest <em>U.S. News &amp; World Report</em> rankings. Rochester Institute of Technology is among the top third “National Universities,” and among the top 50 choices of high school guidance counselors, according to U.S. News & World Report rankings. RIT this year ranked 102 out of more than 300 universities in this category, which includes the nation’s best-known colleges and universities. These top universities “offer a full range of undergraduate majors, plus master’s and Ph.D. programs, and emphasize faculty research,” according to U.S. News. 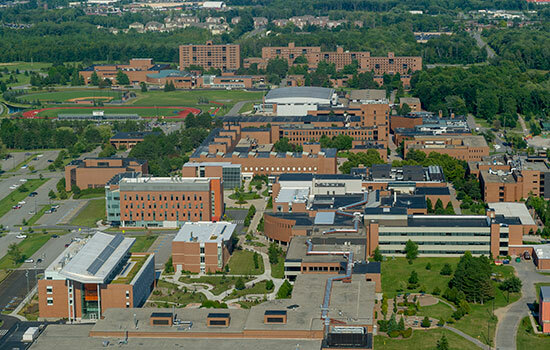 The 2019 edition of U.S. News & World Report Best Colleges also cited strong rankings for RIT’s Kate Gleason College of Engineering and Saunders College of Business. And the university was cited on lists for “High School Counselor Top College Picks,” chosen from a survey of 2,400 high school counselors in all 50 states. This is the 36th year that U.S. News has issued these “Best College” rankings. The rankings are based on several categories, with the most weight given to graduation and retention rates, peer assessment and faculty resources. Tied for 59th among 215 engineering colleges programs where the highest degree is doctorate. That ranking for the Kate Gleason College of Engineering was up two places from last year. Tied for 62nd among 405 undergraduate business programs. That ranking for Saunders College of Business was up two places from last year. Tied for 43rd among 145 national universities as a “best value school,” comparing the value of the education received to the price a student pays. To see the full U.S. News national university rankings, go to http://colleges.usnews.rankingsandreviews.com/best-colleges/rankings/national-universities.